Texas is big and there is plenty of sun year round, so it should be a great place to install a solar energy facility on your very own roof–right? Well, to be truthful, Texas actually lags behind many other sunny states in its determination to get homes plugged in to free, clean and green energy from solar panels, but things could soon change and in the meantime those who opt for solar do indeed still get a lot of financial advantages as well as the feel-good factor that they are doing a whole lot of good for our precious planet. There are three main methods of paying for your solar installation: leasing, cash purchase or purchase with credit. 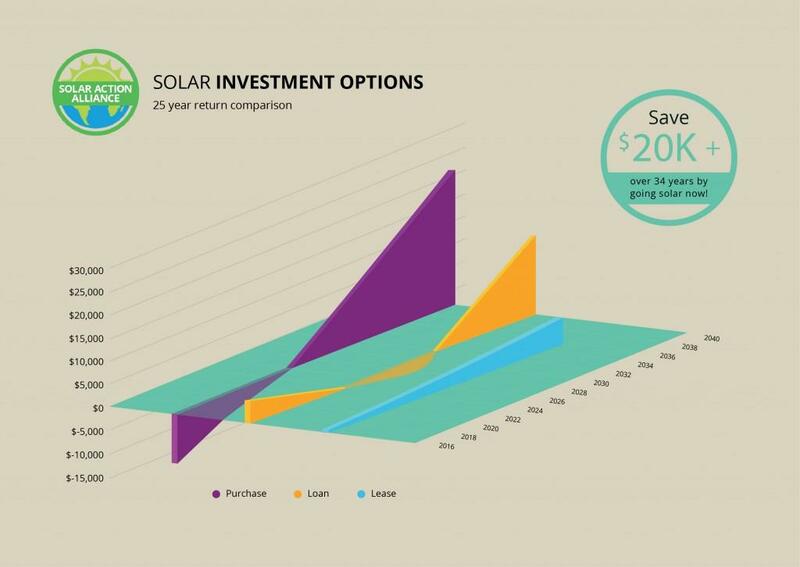 This graph shows how the three compare financially for a typical 5kW solar system. Your numbers will vary a bit, depending on the size of your system and how much electricity you actually use. Whatever choice you make, there is a clear non-financial benefit too, as every kilowatt you use from solar means you won’t need to burn the equivalent amount of dirty, carbon dioxide-belching fossil fuels. This assumes that you have the cash to pay for a solar panel installation outright. A 5kW solar array costs around $20,000. This might sound a heck of a lot of money, but some utility companies offer rebates on solar equipment and the Feds provide a tax credit of 30% of the cost of your system, so effectively your system really costs only $9,400. If you save around $1000 a year in electricity (a conservative figure, given the way energy costs normally rise), your system will pay for itself in less than ten years. 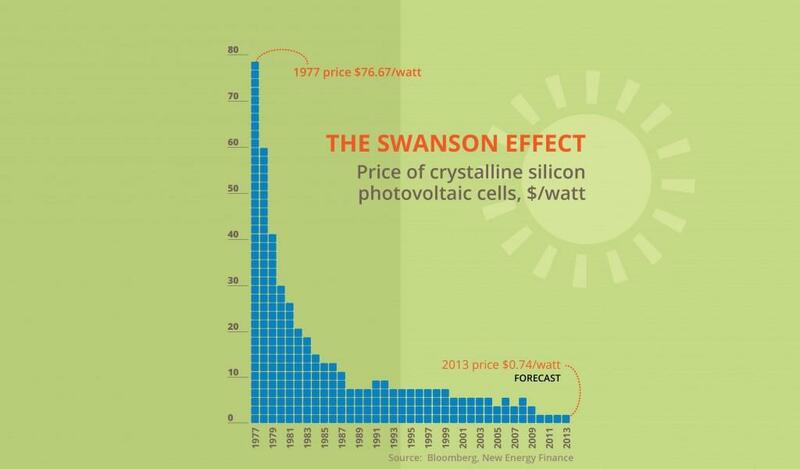 A typical solar panel installation is expected to last at least 25 years. 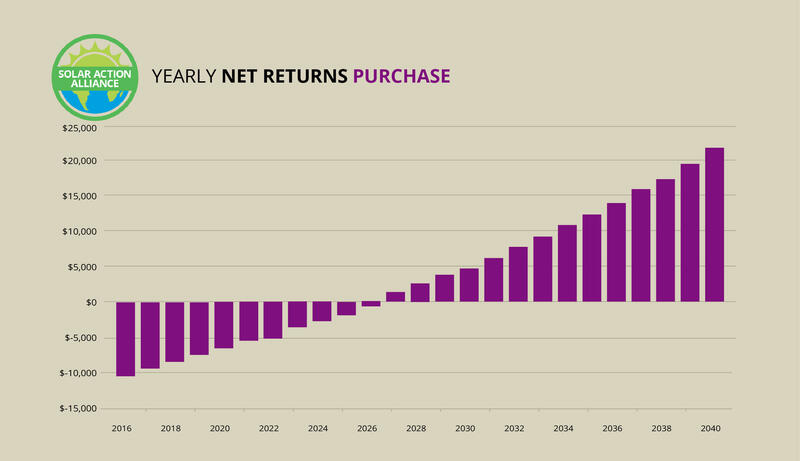 Most last a lot longer than that, but there is a gradual, slight reduction in performance over time. That means you’re looking at 15 years of free electricity. In fact, the figures show that the return on a typical solar investment beats just about any high ranking blue chip investment over the long term. This is a great option if you still want to own your own rooftop installation, but don’t have the cash or don’t want to commit what cash you have to an outright purchase. Basically, all the advantages already outlined above still apply. Because you are buying the solar panels – even if someone’s loaning you the money – you get the rebate given to you by the utility company and you also get the federal tax credits and the savings from any power you produce which you don’t have to buy from the utility. Set against all that, of course you do have to make repayments. Those all depend on the type of loan you get, but 5% repayments with a home equity line of credit type of loan are typical at the moment. With an initial $20,000 loan at 5%, that means you will certainly be paying back more than what you save on your energy bill, but with energy costs going up every year and your loan fixed at the time you made the arrangement, then you should find that you start to save after 15 years – and in another 5 years the panels are yours. The other great advantage of either buying outright or buying through a loan is that your property’s value goes up, and that additional value is not taxed. 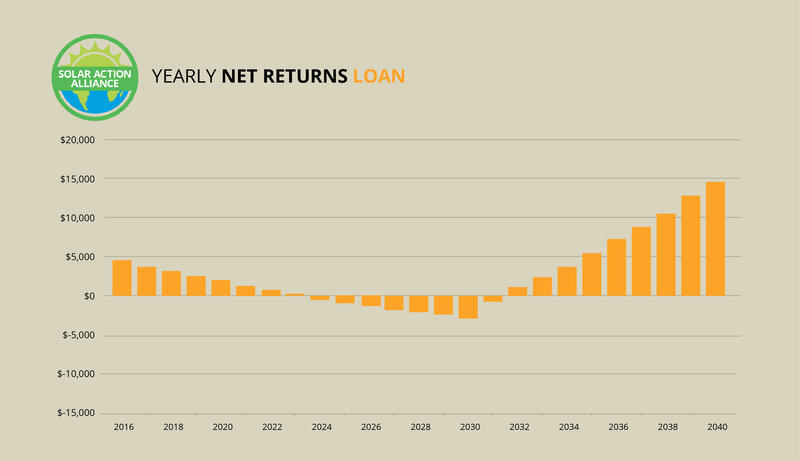 Leasing is a smart choice for those families and homeowners who don’t want the expense or worry of buying a solar installation and like the idea that the solar provider is responsible for all maintenance and repairs. To be honest, there is little of that needed for solar power installations – they are remarkably trouble-free and need very little maintenance except keeping debris and dirt from accumulating on top of the panels. 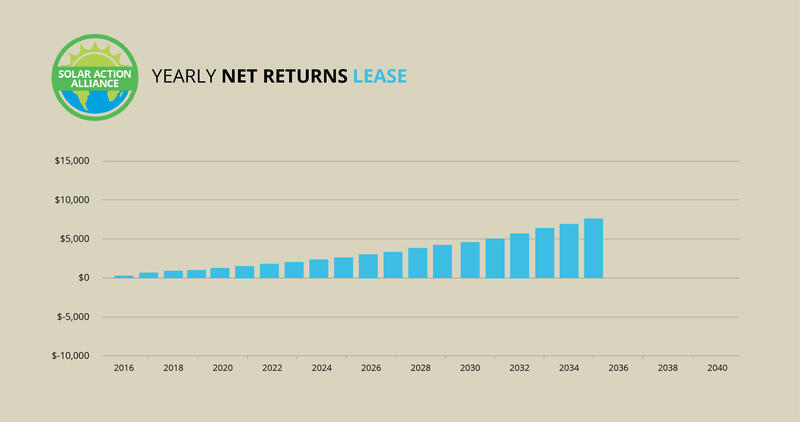 Even still, leasing provides peace of mind that someone else does the work and takes the risk while all you get is the savings from all that clean, green energy. Leasing options do vary a little. Some of them involve you paying a monthly rental. Others mean you pay for the power you consume–typically, both options add up to a bit less than what you might have to pay if you were buying power straight off the grid. And because of the difference in the way ordinary, conventional electricity costs are going up compared to what you expect to be charged by your solar provider the difference between what you have to pay and how much you can save goes up every year – with you the eventual winner. 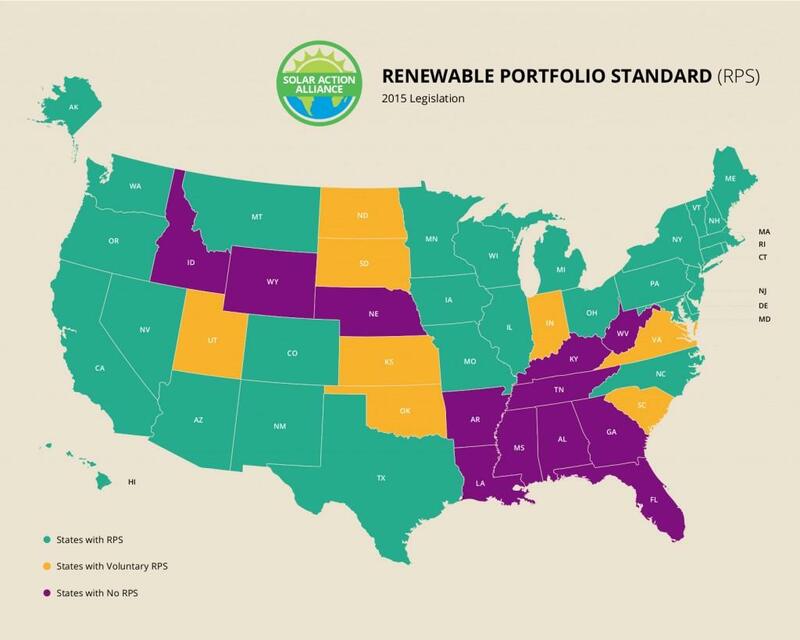 An RPS is a law setting what percent of a state’s electricity must come from renewables. Utilities that don’t meet the deadline have to pay fines, which gives them an incentive to help their customers go solar. Unfortunately, Texas has no such law. The state did have a modest RPS, which its major utilities had already met, but the law has been repealed. Fortunately, some municipalities have their own pro-solar programs which partially make up for the lack of a statewide RPS. In Texas, the portion of your home’s value that is due to your solar installation is non-taxable. Some state utility companies will give you a rebate for every kilowatt of solar power you install, depending on where you live. Texas has no statewide net metering law (although, again, some municipalities have their own) so you will probably not get paid for any surplus power you generate, but at least the state has a decent interconnectedness policy so you can connect your system to the grid. 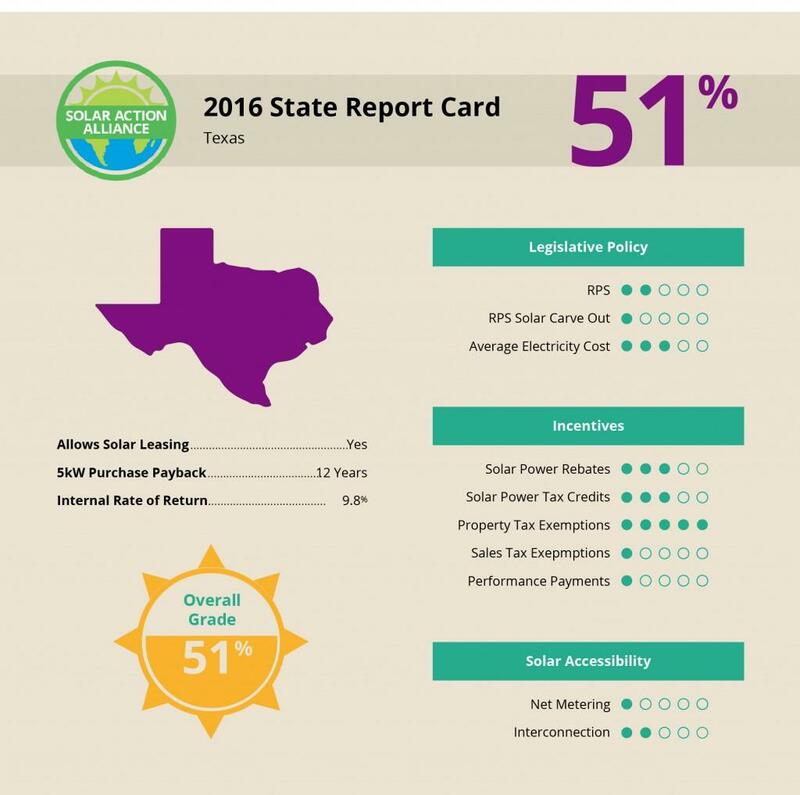 If Texas passes net metering, you’ll be all set. The bottom line is that while Texas does offer some advantages for solar, state leadership still thinks its future lies with fossil fuels. But things can change really quickly. Think about smoking – it took twenty years for public attitudes to shift on how unhealthy that habit was and it’s sort of similar with energy use. In the meantime, you, the home owner still has the advantage of being able to choose what you do and the reality is that even here in the Lone Star State, if nothing else because of the abundance of sun we get in most parts of this state, solar energy installations are a really great way for you to benefit financially, cut your dependence on the power company, and do your bit for this beleaguered planet.